The Surface Stereo Imager camera on NASA's Phoenix Mars Lander captured this view on the mission's 148th Martian day, or sol (Oct. 24, 2008), about a week before the lander's final communication. The view shows a trench called "La Mancha" excavated by Phoenix. Textures of the soil where the arm has disturbed it are indicators of the cloddiness of the soil. Researchers from Imperial College London have been studying and analyzing individual particles of Martian soil that was collected during the 2008 NASA Phoenix mission to Mars. They believe that their research shows that liquid water has been on the surface of Mars for far too short a time for life to maintain a foothold on the surface. Mars may have been arid for more than 600 million years, making it too hostile for any life to survive on the planet’s surface, according to researchers who have been carrying out the painstaking task of analyzing individual particles of Martian soil. Dr Tom Pike, from Imperial College London, discussed the team’s analysis at a European Space Agency (ESA) meeting on February 7, 2012. The researchers have spent three years analyzing data on Martian soil that was collected during the 2008 NASA Phoenix mission to Mars. Phoenix touched down in the northern arctic region of the planet to search for signs that it was habitable and to analyze ice and soil on the surface. The results of the soil analysis at the Phoenix site suggest the surface of Mars has been arid for hundreds of millions of years, despite the presence of ice and the fact that previous research has shown that Mars may have had a warmer and wetter period in its earlier history more than three billion years ago. The team also estimated that the soil on Mars had been exposed to liquid water for at most 5,000 years since its formation billions of years ago. They also found that Martian and Moon soil is being formed under the same extremely dry conditions. Satellite images and previous studies have proven that the soil on Mars is uniform across the planet, which suggests that the results from the team’s analysis could be applied to all of Mars. This implies that liquid water has been on the surface of Mars for far too short a time for life to maintain a foothold on the surface. During the Phoenix mission, Dr Pike and his research group formed one of 24 teams based at mission control in the University of Arizona in the USA, operating part of the spacecraft’s onboard laboratories. They analyzed soil samples dug up by a robot arm, using an optical microscope to produce images of larger sand-sized particles, and an atomic-force microscope to produce 3D images of the surface of particles as small as 100 microns across. Since the end of the mission, the team has been cataloging individual particle sizes to understand more about the history of the Martian soil. In the study, the researchers looked for the microscopic clay particles that are formed when rock is broken down by water. Such particles are an important marker of contact between liquid water and the soil, forming a distinct population in the soil. The team found no such marker. They calculated that even if the few particles they saw in this size range were in fact clay, they made up less than 0.1 percent of the total proportion of the soil in the samples. On Earth, clays can make up to 50 percent or more of the soil content, so such a small proportion in the Martian samples suggests that the soil has had a very arid history. They estimated that the soil they were analyzing had only been exposed to liquid water for a maximum of 5,000 years by comparing their data with the slowest rate that clays could form on Earth. The team found further evidence to support the idea that Martian soil has been largely dry throughout its history by comparing soil data from Mars, Earth and the Moon. 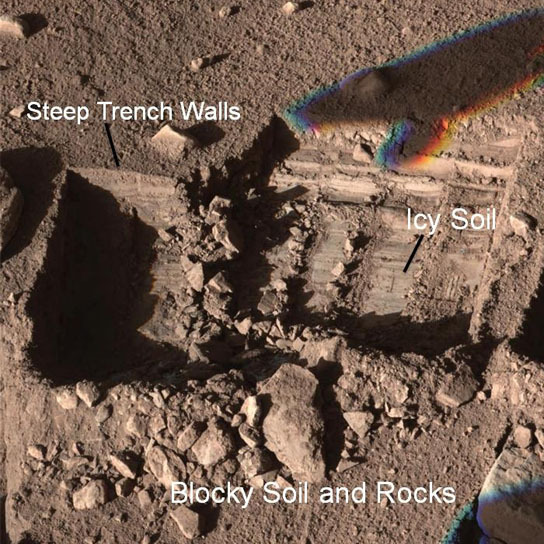 The researchers deduced that the soil was being formed in a similar way on Mars and the Moon because they were able to match the distribution of soil particle sizes. On Mars, the team inferred that physical weathering by the wind as well as meteorites breaks down the soil into smaller particles. On the Moon, meteorite impacts break down rocks into soil, as there is no liquid water or atmosphere to wear down the particles. Be the first to comment on "Researchers Believe Mars Surface too Arid for Life"